That would mean 1095 search requests a year. Since we plant a new tree for every 45 searches on average (you can find more information on this here), you alone could finance 24.3 real trees every year. Now imagine that you persuade 500 people, for example in your office, to start using Ecosia and contributing to the tree planting effort. That would mean we could plant 1.215 actual trees in a year. What if you could convince an organisation of 5000 members to install Ecosia as their default search engine? That would be 121,500 trees planted in a year. All totally financed by searches. And now imagine a university with 15,000 students. If they were to all the switch to Ecosia you could finance the planting of 364,500 trees in just one year! Together our potential is huge! 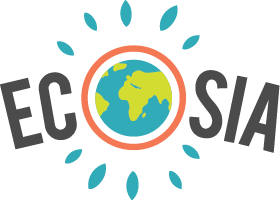 Perhaps you know someone at work or at university who could help you to introduce Ecosia to someone from IT or senior management? Maybe there is sustainability group at your school or university who you can talk to and help you approach senior staff. Perhaps your local library would be interested in setting up Ecosia on their computers. Do you know which search engine you local council is using? Does your favorite organisation still use Google? Installing Ecosia is easy! This simple guide provides any System Administrator or IT department with everything they need to setup Ecosia as a default search engine across multiple computers. If you or anyone you are in touch with would like to know more information, such as how many trees the company or university has financed as a whole, they can drop us an email at info@ecosia.org and we will happily take care of it. Likewise for all other questions about installation or our reforestation projects, feel free to send us an email. If you would like some material to help you present Ecosia to others, this document contains all the links to our videos of our planting projects, our business reports, planting partner receipts, interviews, photos, information on our projects, Blog and our FAQ! If you find you need any help at all, feel free to send us an email. We are very grateful to you for your support and look forward to countless new trees and great users just like you! Does Ecosia have Group Policy Templates?